*This interview was originally posted at The Film Experience. This year’s foreign language film race at the Oscars is so unusually packed with auteur names and festival successes that the typically middle-brow branch will really have to try hard not to get things right. Among this wealth of possibilities, one of the titles we haven’t heard much about is Mexico’s submission, After Lucia. I recently had the chance to watch the film and I was blown away by it. So much so that it now sits at the number one spot on my favourites of 2012. It’s a confidently directed, outrageously frank study of bullying in the schools of Mexico through the experience of a teenager named Alejandra (brilliantly played by newcomer Tessa Ia). The richly conceived film reveals much while saying very little. Economically filmed and sharply edited, After Lucia is a devastating experience but an absolutely vital one. Yet, it’s too easy to see why Oscar pundits haven’t given it much thought. The voters in this branch have often preferred their social commentary sugar-coated and this type of brutality can make them feel like they’re subjected to the Ludovico technique. But before we write off its chances, let’s remember that Greece’s Dogtooth, winner of the Un Certain Regard award at Cannes — which After Lucia also won, found its way to the ceremony. And After Lucia might benefit from its tender subject matter and the delicate story of Alejandra and her single father who are dealing with death of the family’s mother (the titular Lucia). 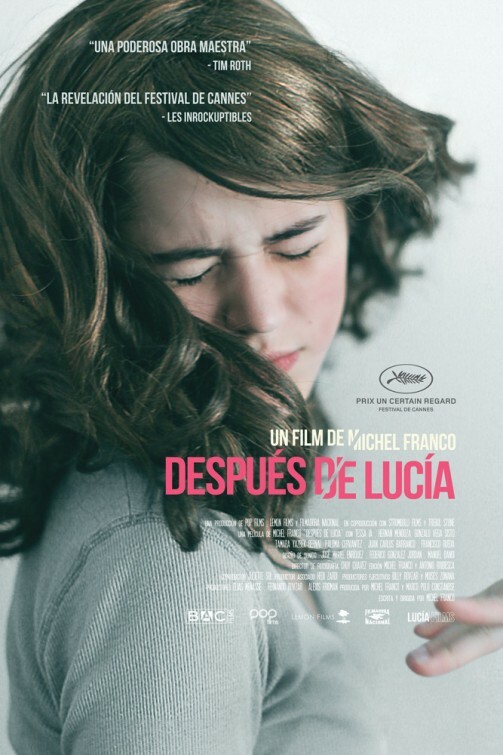 On the occasion of the film’s submission to the Academy, I spoke with the film’s director, Michel Franco, who took time off from post-production work on his next film to chat about After Lucia, the issue of bullying and his cinematic influences. AMIR: What was the starting point of the project for you? The family angle or the bullying angle? MICHEL FRANCO: The point of the project, at first, was to deal with a father and daughter coming to terms with the death of the family’s mother. It had nothing to do with violence or bullying. As the project developed the bullying story became more important. The thing is, in life you always deal with a lot of things at the same time. The way each of these characters dealt with grief led me to the violence that exists in our society on a daily basis. Those things combined, and that’s what I thought was worth making this film about. Amir: So it came from a more intimate place. MICHEL FRANCO: Yeah. It was always going to become more than a family story but the origin was that. If I’d set out to make a film about bullying and violence, it wouldn’t have become what it is now. I think that personal angle lets you understand how things work for her at school. It gives the audience perspective. Is this becoming a prominent issue in the Mexican media? Bullying? It’s been getting more and more attention in the last two years. When I started writing the script, you’d never hear the word ‘bullying’ in Mexico. It’s been an issue for a long time of course, but there wasn’t even a specific term for it. Within the last two years, it’s really been talked about quite often, because several suicide cases have occurred because of it too. As I said, it was happening before, but nobody had labelled it and no one approached the issue with the seriousness that’s required. But it’s finally coming to the fore and actually our film has helped bringing attention to it quite a bit too. I’m not surprised. It’s impossible to ignore this issue after watching your film. And the devastating subject matter aside, I think a lot of it comes down to your direction. At the beginning the audience might think the static single camera is a financial decision, but as the film progresses that type of camera work becomes harrowing, like you’re trapped and forced to endure Alejandra’s pain. My main purpose with the camera is to provide an objective point of view. I guess you end up feeling helpless but you’re present there with the character. I don’t want to manipulate the feelings of the audience. That’s what I mean by an objective camera. But in reality we do let these things happen in real life and look on sometimes. In the scene where the father leaves his car and gets into a fight with someone on the street, you’re sitting in the car looking at them and the camera doesn’t move, because that’s a common thing in Mexico and people just see that and move on. I’m glad you’re pointing it out, because that sort of objective perspective is exactly what I wanted to provide. And a similar thing happens in other instances too, like with Alejandra in the washroom and us sitting in the other room looking at her friends. It’s quite frustrating. Tessa Ia’s performance as Alejandra is very powerful too. Can you tell me about the character and how she was cast? At first it was a male character, actually. Tessa’s mother is an actress in Mexico whom I’ve known for a long time and she’s a close friend of mine. One day I happened to see Tessa just hanging out with her friends and I thought that would be a great conversation to capture for the film and it struck me. Why not just ask them to be in the film? And they all accepted. So the character became a girl. And anyway, I don’t like a traditional casting process. I saw the father doing a play in the theatre and I just gave him the role too. That was it. I don’t like auditions. That’s an incredibly difficult dynamic to pull off between the kids. Are they all her friends in real life? Yeah, absolutely. They’re best friends. I figured it would be easier to tolerate the violence if it’s done to you by your best friends. It’s the only way to pull it off actually. And to be honest, I dislike teenage actors. [laughs] Nobody should be pro at anything at 16. I’m still reeling from the ending of your film. It’s so horrifyingly shocking. As it was happening, I was playing out different scenarios in my head. Did you ever consider alternate endings? No. That was always going to be the ending of the film. I knew that all the violence would beget more violence. I did wonder which direction that would take me, but once I settled that was always going to be the end of the film. We talked about the violence a lot but in reality we don’t see much of it. It’s mostly implied. And I’ve heard a few people compare your work to directors like Michael Haneke for that reason. Having seen your two films, I personally sensed the influence of another European filmmaker, but I’m curious to know your own opinion. My biggest influence is Ingmar Bergman. That’s who I had in mind! I really like watching Bergman’s work, because of the economy of the work and the storytelling and camera and sound and the way the actors behave. I also like Cassavetes a lot. I love the way he handled his actors. Those two would be my main influences. I hear the Haneke comparisons a lot from journalists. [Laughing] It’s an opinion I respect but I don’t see it myself. I think you have a really unique and vital voice. I’m so curious to see what you’re making next. Will the gap be shorter than between your first two films? Thank you, and yes. The new film is going to be out next year. I’m not sure which festival yet, but it will be out. The reason it took me so long for After Lucia was that I changed my approach on many things. I became a producer for one thing, because no producer will ever understand me as well as I do. It’s a collaborative medium so obviously I’m working with others, but I choose the right people. And I’m in charge of some things I wasn’t before. For example, the casting, which as I said wasn’t a traditional process anymore. So those three years were spent to just adjust myself. I’m working on the script for my fourth film now and the third is in post-production, so I’m being a lot more productive. I’m happy to hear that. Good luck with the films and at the Oscars! My horse won this race last year and I’m hoping for a repeat with your film! Thanks! Our film’s about an issue that’s very important in America, so I’m looking forward to it!